The Sarah Collection is billed by Spring Time Bedding as "the ultimate in comfort and luxury." Cited features are sculpted cushions, heavy density support foam, foam encasement, 7-turn coils, multiple foam comfort layers, and "resilient" quilting. This collection includes both tight-top and pillowtop models, with the tight-top ones firmer. The nine models of Sarah Collection innerspring mattresses range from 12 to 14 inches in height. The three 3-model series within this collection are labeled Black Pearl (1000, 998, 999), Gold Pearl (518, 519, 520) and Silver Pearl (515, 516, 517). Each series has a 12", a 13" and a 14" model. The top panel in the cover of each Sara Collection mattress is a stretch knit fabric (called "luxurious") tack-and-jump quilted to three layers of high-density firm foam. It is this firm quilting foam which accounts for the cover's resilience. The strech knit is supposed to move with the foam in responding to a sleeper's body without ridging. No fewer than five comfort layers are described in Sarah Collection models. The top two layers are called "sustainable" which seems to be a reference to the use of plant-based oils in making the foam. This reduces the use of petroleum products and makes it easier to eliminate volatile organic compounds. The next two comfort layers are made of high-density medium-soft foam. And the bottom layer is HD firm foam. The foam type is not identified, but the industry standard bedding foam is polyurethane, a generally durable and versitile material. 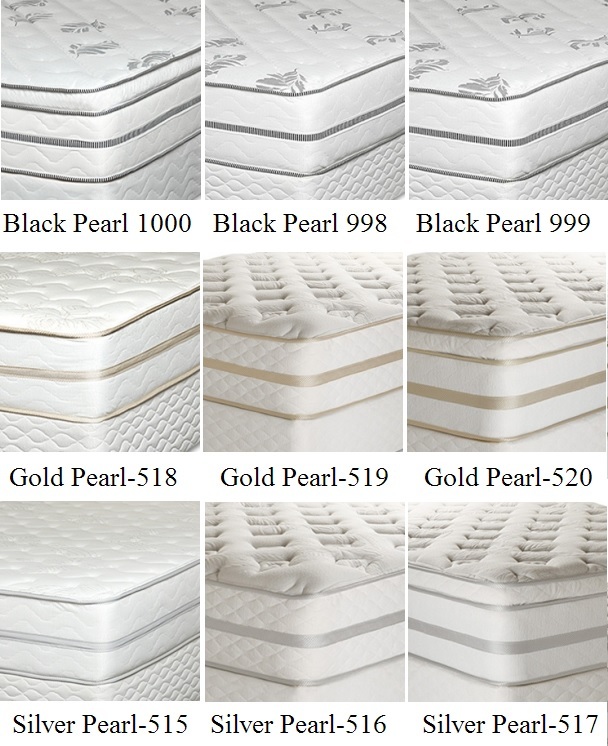 As the firmness and heights of the foams vary from model to model, so does the comfort level of individual mattresses. One is rated as firm, others as luxury plush firm (medium firm), firm plush (medium), and one as very firm. Spring Time Bedding's Sarah Collection innerspring mattresses are surrounded 360° by foam encasement to stabilize the coils and act as edge support for the sleeping surface. No sagging edges to make a sleeper roll off or a sitter slide off. An innerspring of 460 coils (in Queen size) provides support for the mattress and sleeper(s). These heavy-gauge coils have seven turns. The more turns a coil has, the firmer it is. The top of the innerspring is separated from the foam by a 2-layered insulator pad. This keeps the coil from damaging the foam. It also transitions the support from the springs to the foam. The recommended foundation is a matching upholstered wood-framed platform, which provides sure support for the mattress with a bit of give. It also elevates the mattress above the floor to make it easier to get into bed. The foundation is usually placed on a steel frame, and one with six legs is required for a mattress and foundation queen-sized or larger. Sarah Collection mattressess are covered by Spring Time Bedding with a 15-year limited warranty. The first five years are non-prorated, while the remaining ten years are covered on a pro-rata basis. The mattress must be kept clean and not have been abused, which makes a mattress protector advisable.